Customers are the foundation of any business. With customer satisfaction, more often than not, it’s the smallest details that make the biggest difference. 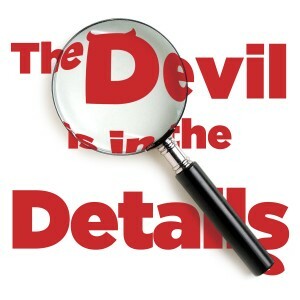 There’s an old saying, “The Devil is in the details.” What better place to see the truth of that statement than in the way a business interacts with its customers? Here are a few stories to help illustrate the point that it’s the little details that really make a lasting impression in a customer’s mind. And that impression, even if it doesn’t result in an immediate sell, can lead to valuable referrals. In mid-December 2002, Uncle Sam had me on a plane headed for Japan. I left the American landscape – square, expansive fields, straight lines, and uniformity – and flew off into the unknown. After more than ten hours of flight, the massive plane dipped below the clouds, revealing a landscape full of mountainous, tiered farmland; rice fields; and a multitude of irregularly shaped plots of land. My first real customer service interaction there was in the airport, where a group of five flight attendants patiently endured my attempts at communicating – I essentially butchered their language – as they tried to assist. If they were annoyed, it didn’t show. They seemed more grateful that I was trying than irritated with my ineptitude. Let’s contrast this with my experience at the airport when I returned to the U.S. a few months later. Jet-lagged, craving a cigarette, and too tired to navigate on my own, I asked the nearest staff member where the bathroom was. He pointed to the sign, adding a polite “What, you can’t f***ing read?” Now that’s what I call good old U.S. customer service. It’s those “little things” that count. At first, it’s a little startling, and maybe a bit odd, but think about it. What better way to make customers feel welcomed than literally yelling “Welcome!” at the top of your lungs when they walk through your doors? Five years of living there and that warm-and-fuzzy feeling never wore off. The point here isn’t to say that American businesses should do exactly the same. It is, however, to say that it doesn’t take much effort to find simple ways to make your customers feel welcomed and important. Be friendly. Sometimes the best customer service is as simple as just being nice to your customer. Show your appreciation. Without their business, you would be out of yours, so thank them for it. Don’t rush. Take the time to show you truly care about his or her needs. Customers don’t enjoy feeling like they’re on an assembly line.